Theodossis Theodossiou and Kristian Berg from the Photochemical internalisation (PCI) group at the Department of Radiation Biology have been funded by the Euronanomed II ERA-NET program. The project receives 1 million Euros together with 3 collaborating academic partners from Greece and France and one French commercial partner. The project, named PCInano, will be coordinated by Kristian Berg. This is the first time Norway is the coordinator of a Euronanomed (ERA-NET) project. The aim of the project is to develop nanoparticle-mediated PhotoChemical Internalization (PCI) of small anticancer drugs. Current cancer chemotherapy treatments are limited by noxious or fatal side effects and drug resistance due to long-term treatment. Nanocarrier-based strategies may be an attractive alternative to solve these problems. However, so far nanocarriers have not shown sufficient specificity for neoplasia and/or sufficient efficacy and thus have shown limited translation from the bench to the clinic. In order to overcome this, the PCInano project will implement a novel nanoparticle-based, cancer‐specific drug delivery system, based on the PCI technology developed by the PCI group, allowing for controlled drug release upon light irradiation. This will be implemented by parallel administration of the PCInano nanocarriers together with a light activated agent (photosensitiser, PS). Our cyclodextrin-based nanoconstructs are expected to remain sequestered in the cell’s endocytic vesicles until irradiated. 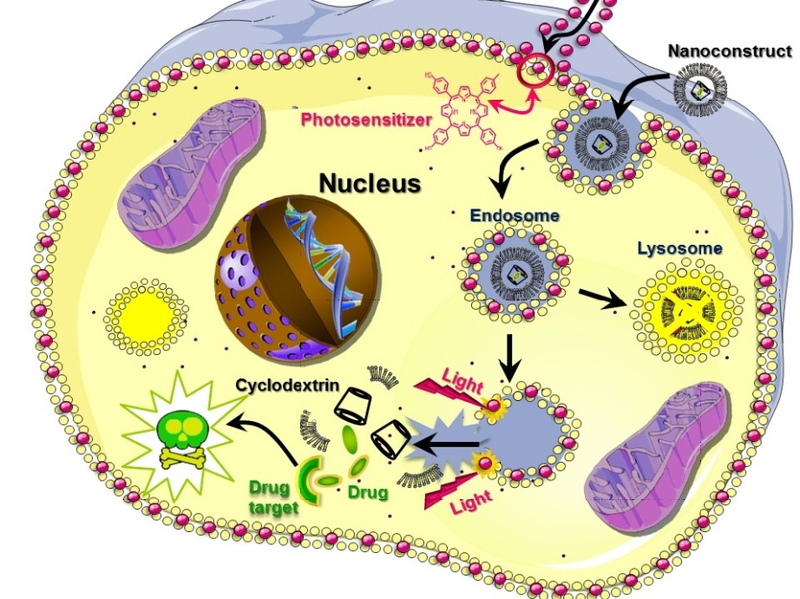 Upon light activation, the membrane‐resident PS will rupture the endocytic vesicles and the nanocarriers full drug payload will be released within the target cells, free to engage vital intracellular targets. PCInano will provide validation of the proposed technology in vitro and in vivo, primarily in difficult to cure ovarian cancer models because of the relevance to the drugs of choice. The drugs that are delivered by this technology are small anticancer drugs suitable for binding to the cyclodextrin-based carriers. The proposed technology will hopefully mature into a cost‐effective and once‐off cancer‐specific treatment. Photochemical internalization of tamoxifens transported by a "Trojan-horse" nanoconjugate into breast-cancer cell lines. Theodossiou TA, Gonçalves AR, Yannakopoulou K, Skarpen E, Berg K.
Angew Chem Int Ed Engl. 2015 Apr 13;54(16):4885-9. doi: 10.1002/anie.201500183. Epub 2015 Feb 6.